We’ve all been there. Stuck somewhere, desperately searching for a nearby toilet. When you need to go, you need to go! Stepping into a cafe, restaurant or store, it can be frustrating being told you can’t use their toilet, unless you’re willing to make a purchase, and consequently, wasting more time as you’re stood there, legs crossed in desperation. While most of us will just leave disappointed and continue our search for a usable loo, one woman had quite the overreaction when she was told ‘no’. 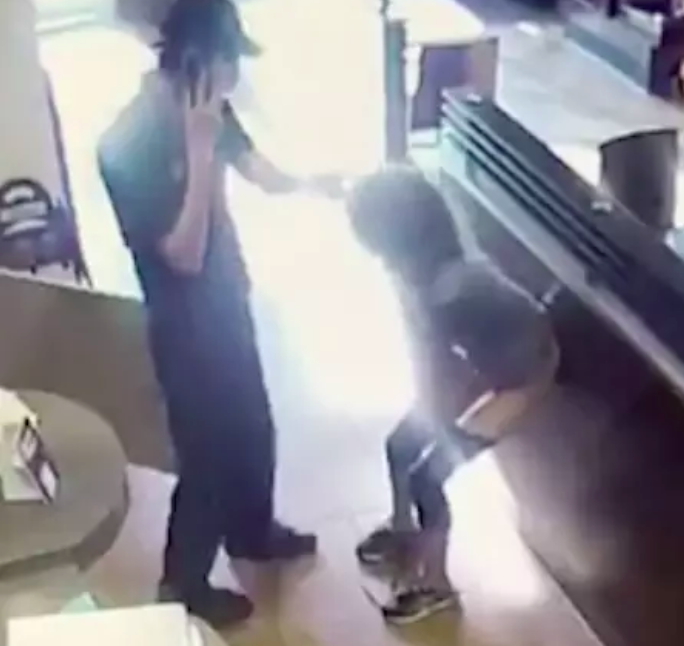 On Monday evening (May 14), a Canadian woman decided to pull her pants down, have a poo and then throw it at the poor Tim Horton’s worker who wouldn’t let her use the toilet. Security footage of the incident was shared on YouTube but of course, was quickly deleted. 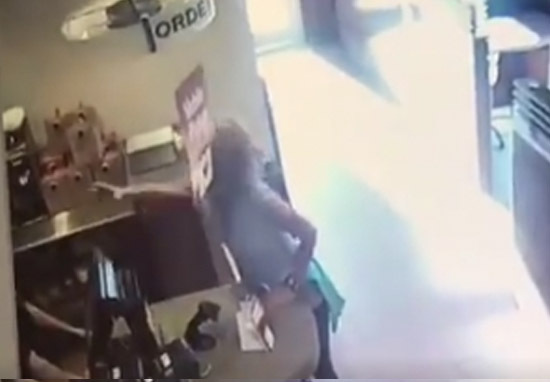 As you can see in the video, the angry woman really does go for it, while the Tim Horton’s worker remains reasonably relaxed. 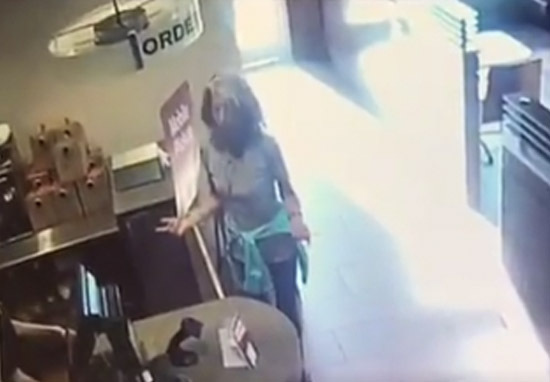 A spokesperson for the Canadian coffee chain told BuzzFeed, the woman was denied the use of the toilet due to her ‘past behaviour’ in the cafe which just makes us all the more curious. There is a restricted access policy for restrooms to ensure the well-being of our guests. We strive to create a welcoming environment for all of our guests and the communities we serve. We are deeply concerned by this video as the safety of our team members and guests is always a top priority for us. It was also confirmed the employee was on the phone to the authorities in the video, who are continuing to investigate the incident. Holly Largy, a spokesperson for the Royal Canadian Mounted Police in Langley, explained the woman was ‘briefly detained after the incident’ and will appear in court at a later date. While her identity has not yet been released, Largy confirmed she’s known to police who’ve ‘dealt with her before’. The video has since gone viral online, leaving social media users reacting in their masses. Just when you think this world can’t get any worse… someone takes a cr*p, and then flings it at others she is in conflict with. Not being in control of your thoughts, mouth, and actions is becoming too common people. Just when you think this world can't get any worse….someone takes a crap, and then flings it at others she is in conflict with…#timhortons Not being in control of your thoughts, mouth, and actions is becoming too common ppl. ? We got YouTube lady, 65,000 texts lady, and now Tim Horton’s sh*tter lady. Since when was the logical culmination of an argument a poop. WHY IS NO ONE ELSE PHASED BY THIS ALTERCATION?!? No one else seems to move. If I even had an inkling that someone was about to poop near my coffee I would be out there in a flash for fear of being pebble-dashed by a rogue turd. 6. Who was that poor Tim Hortons employee that came to work on that fateful day not knowing that in a few short hours they would probably be covered in a woman poop? We just hope the poop-thrower gets the justice they truly deserve!